Devin Thorpe has collected over 150 essays on personal and family finance to help you learn how to be happier with your money, to live more frugally and investment more wisely. 925 Ideas... is an easy and readable guide to help your family find financial peace. 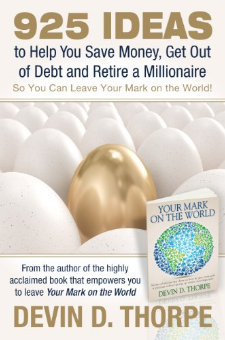 Author Devin D. Thorpe explains: 1) how you and your spouse can find agreement on money matters, 2) how to teach your kids about money, 3) how to pay for your children's college education, 4) how to live like a millionaire (spoiler alert! Frugally)5) how to come up with $25,000 in a crisis6) how to make ends meet on one income7) how to get out of debt and stay out of debt8) why home ownership should be your family's top financial priority9) how to ask your boss for a raise10) how to use your finances to do more good in the world.And much more!Devin D. Thorpe is the author of the highly regarded book, Your Mark on the World and is the founder of the Your Mark on the World center, championing social good. The Your Mark on the World center believes that everyone, no matter their level of income, can give more and do more to make the world a better place. The empowering lessons of 925 Ideas will enable you to leave your mark on the world.